I finally have gotten around to making a vacuum table for my machine. I was planning to make one the fill size of my tabletop but decided it was a bit ambitious for a first attempt. How right I was. The idea for this build was built on one simple idea. Large holes for the pods fed by tiny holes such that even if many of the holes are uncovered the vacuum cleaner that I plan to use fore this projecj will still be able to keep the vacuum up to the rest of the pods. This is the mistake made in many designs that I have seen. They use large holes which as soon as they are uncovered, the vacuum source can't keep up with the air pooring in through the holes and the rest of the pods loose their vacuum as well. By keeping the holes small the effect of uncovering these holes is minimal and the rest of the pods should keep their vacuum. The price to pay for this it the increased time to pull a vacuum on the individual pods but this is very minimal. You don't need me to tell you this. If you have ever tried to paint it you will know it acts like a sponge and soakes up the paint like a thirsty man in a desert. I therfore thought it might loose a bit of air through the sides and I might need to seal the edges. I did keep plenty of material between the channels and the edges to reduce this but I wasn't prepared for the results. I had thought the compressed surfaces would be immuned to the air being pulled through them but how wrong I was. Inital testing early on in the buikld showed the MDF held the vacuum of but as time went on the MDF became more porus to the point where it doesn't really load the vacuum when the entire surface is covered. I have already come up with a simple way of fixing it and will be giving that a try next. 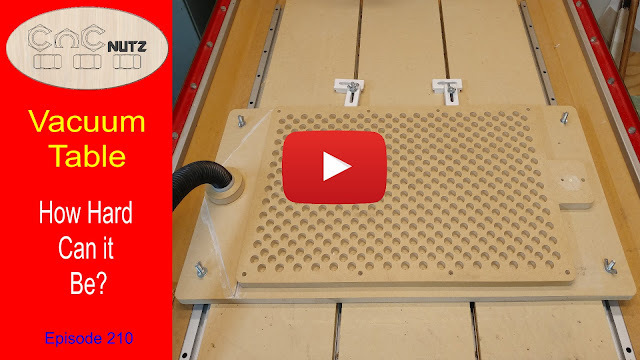 It has also given me a crazy idea on how to make the workds somplest vacuum table which I will give a go as well. How about covering the offending faces with a thin vinyl contact paper (vinyl -- paper??). It is cheap, easy to apply and air tight. The slots are 6.35mm (1/4")wide 10mm (3/8") deep. They vary in length to reach the center of the ports in the platten. If you look at the hole in the top you will see they have the same patten.The slot lenght you need will depend on the Platten you use. I have not given plans for this as I plan to revisit it and see if i can improve on the design. Pete, very well done video on vacuum tables and some of the gotchas most people would not be aware of. I look forward to seeing some of the enhancements you plan to make. Just like your CNC machine that is has gone through some changes based on what you have done using it and see improvements which is evident on your current machine.